Damian McErlain has confirmed Derry’s Slaughtneil contingent will be under no pressure to rush themselves back to county action following their disappointing All Ireland club championship defeat to Nemo Rangers on Saturday. 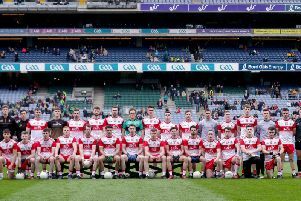 The Emmet’s lost out 1-14 to 2-19 against the Cork champions in extra-time in O’Moore Park in Portlaoise meaning the likes of Chrissy and Karl McKaigue and Brendan Rogers could return earlier than expected. However, despite only one win in four Division Three games to date this season, McErlain said the decision on when they should return is entirely up to the individual players following a tough schedule. “Those lads probably need a break, both mentally and physically so it will be entirely up to them but from me, there will be no pressure on them to rush back because you need them when it comes to the summer, not just for the next two or three weeks,” explained the Derry manager. Saturday’s two points defeated ended any lingering hopes Derry had of a late promotion charge with McErlain admitting the Oak Leaf emphasis now is on securing their position in Division Three. “I don’t think even mathematically we can look toward the top two in the table now so it is about getting a couple of wins under our belts, keeping ourselves safe and building for the rest of the summer,” he added.